Pop quiz: You open up your laptop and discover all your files are encrypted and a mysterious message says you're not getting your data back unless you give someone $5000 via an anonymised service. You quickly check all the other computers at work and they're in the same boat. What do you? Well the simple answer is: NOT pay the ransom but that doesn't appear to always be the flavour of the month. A Taranaki school has been hit hard by a ransomware attack - sadly, some of the students' work is caught up and so is some of the teachers' assessment work. The pressure must surely be on to retrieve the data that is lost but sadly there is one thing you can guarantee about any data that is unscrambled - you don't know what's happened to it since last you saw it. Sure, on the one hand it could be simply encrypted and then decrypted when you've paid up. Yes, that is entirely possible. But it's also possible that a secret payload has been added, something that tracks your keystrokes and reports back to base. Or something that collects your contacts and addresses and sends them similar ransom attack packages as the one you got. Or it could be that in a year's time the system will lock you out again and they'll demand $50,000 this time. Instead, you're better off putting the money towards a time machine, travelling back in time to an era before you got hit and making sure you've backed up all your data to a secure off-device location. And since I am from the future, I can tell you I'm here to remind you all to do that at once. Right now. Don't wait - off you go. Because the only way to defeat a ransomware attack is to say "meh, I don't care", wipe the machines and start over. It's the only way to be sure. Questions will be asked about how a school can be hacked in such a way - questions that will need good answers - but for now, Hawera High School is our Cautionary Tale of the week. It's great to see New Zealand developing a new string to our economic bow. Not just because of the impending meatpocalypse - the day when the bulk of protein consumers decide the nu-meat tastes just as good, costs a fraction and doesn't need massive paddocks of cows to deliver it - but because we really are quite good at this digital thing and we totally should do more of it. Now we have the pipes to connect to the world, it's high time we used them to deliver local products and services to market, and so it is great to see the interactive game market surge towards the half billion dollar mark. Game developers earned $143 million - up 43% year on year - in the financial year ended March 31, according to an independent survey by the New Zealand Game Developers Association. Exports made up a whopping 93% of the total sales, which is as it should be. As an employer, games are lucrative as well. We employ 550 people, up 10% on last year, and that figure is set to grow. This is tremendously exciting because if there's any area that will attract kids into the profession it's not going to be accounting software, or point of sale solutions, or supply chain management, it's going to be gaming. Sure, many will then veer off into other areas, but gaming will draw them in and set them up. And having just finished Call of Duty World: War II I can safely say the game industry needs all the help it can get. And finally, a tech story that always makes me smile. Whistleblowers. Yes, those eager folk who come out of the woodwork to expose nefarious dealings and underhand practices that should be shown the door. Where would we be without people within organisations who are willing to stand up and air their dirty linen in public? Well, we probably wouldn't have had Watergate, the Iran-Contra deal or any of the other "-gate" exposés of recent times. Locally, Whale Oil would still be considered a viable source of information and we'd be no closer to knowing what actually happened with our troops in Afghanistan. But ensuring a whistleblower blows the whistle to the right people and doesn't get caught has often been a difficult business. Typically they tend to go to the media because a: more bang for your buck and b: more likely to retain your anonymity. But that doesn't necessarily present the best outcome, so how to encourage good behaviour from someone who is trying to stay secret while doing the right thing? 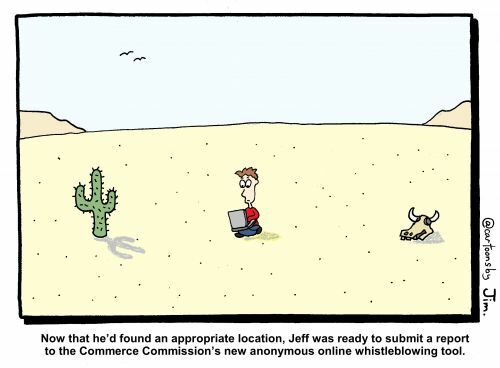 The Commerce Commission has decided to launch an online tool for whistleblowers so they can report cartel activity (think smoky backroom deals conducted in the dead of night, much like the Telco Carriers Forum but without legal protection) without getting spotted. Nice one, ComCom. Now to see if it lives up to expectation and whether anyone can ask for the information under the Official Information Act.